Audi Jacksonville in Jacksonville, FL treats the needs of each individual customer with paramount concern. We know that you have high expectations, and as a car dealer we enjoy the challenge of meeting and exceeding those standards each and every time. Allow us to demonstrate our commitment to excellence! Our experienced sales staff is eager to share its knowledge and enthusiasm with you. We encourage you to browse our online inventory, schedule a test drive and investigate financing options. You can also request more information about a vehicle using our online form or by calling 904-367-3703. Have you ever wondered, "Where is a new and used Audi dealer near me?" Stop searching and start visiting Audi Jacksonville in Florida, serving Orange Park and St. Augustine, for all your automotive needs. We're a full-service Audi dealership with a new and used inventory of top-notch vehicles waiting to be driven home today. You'll also find a dedicated finance center and a quality service department to help you with the car ownership process. Explore the new Audi vehicles available right now, and make sure you see all the new and pre-owned specials happening now. Fill out the finance application online or schedule your next service appointment at your convenience. We look forward to seeing you at 11401 Atlantic Blvd., Jacksonville, FL, for your Audi test drive! 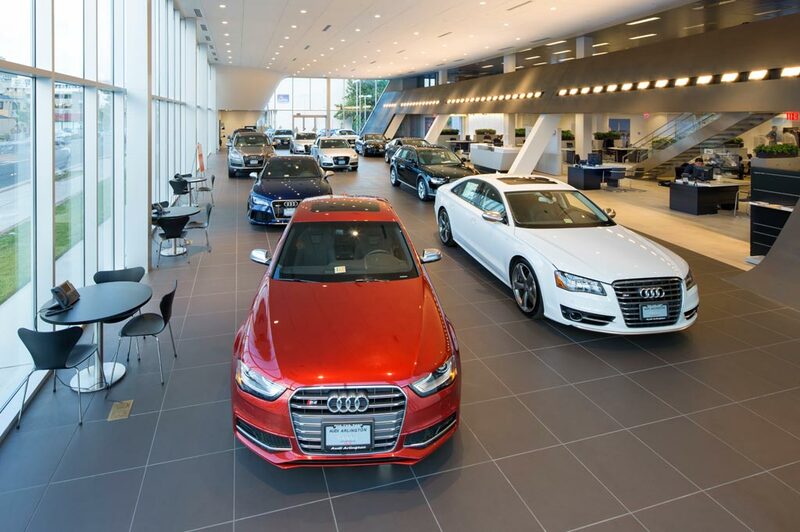 Audi Jacksonville in Florida, serving Orange Park and St. Augustine, has a massive inventory of new Audi vehicles that provide exceptional performance and luxurious comfort. Search for the perfect Audi sedan to match your lifestyle, such as an Audi A3, Audi S3, Audi RS, Audi A4, Audi S4, Audi A5, Audi S5, Audi A6, Audi S6, Audi A7, Audi S7, Audi RS 7, or the Audi A8. Pick one of the stunning SUVs or crossovers to help you tour the country, including the Audi A4 Allroad, Audi Q3, Audi Q5, Audi SQ5, or the Audi Q7. There is also a fine selection of Audi coupes and convertibles, such as the Audi A3 Cabriolet, Audi A5 Coupe, Audi S5 Coupe, Audi RS 5 Coupe, Audi A5 Cabriolet, Audi S5 Cabriolet, Audi TT Coupe, Audi TTS Coupe, Audi TT RS Coupe, Audi TT Roadster, Audi R8, and the Audi R8 Spyder. You can explore new vehicle specials and the featured new vehicles at our dealership by browsing the new inventory online now. We look forward to seeing you at Audi Jacksonville for your test drive. Search for certified pre-owned Audi vehicles at Audi Jacksonville in Florida, serving Orange Park and St. Augustine, and find the one you've been looking for. We offer incredible prices on certified pre-owned Audi vehicles that are prepared to go home today. With a certified pre-owned Audi vehicle, you can drive confidently knowing that every component has been heavily tested to ensure it meets our high standards for quality and reliability. Search through our inventory today, and make sure you see our certified pre-owned Audi specials for the top offers available at Audi Jacksonville. An exceptional inventory of used cars is waiting to be explored at Audi Jacksonville in Florida, serving Orange Park and St. Augustine, so visit today to see what we have to offer. You'll find a variety of different used cars each with their own unique benefits. We have pre-owned specials and a unique CarFinder tool to help you find and select the right vehicle for your lifestyle. Once you've found your perfect match, schedule an appointment with Audi Jacksonville to drive it home. At Audi Jacksonville in Florida, serving Orange Park and St. Augustine, we believe finding new Audi auto loans and used car financing should be simple and stress-free. We conveniently pull together a variety of loan options to help you make the right decision when it comes to financing your new Audi vehicle. Our finance center is with you every step of the way, making sure you stick to your budget and find a payment plan that meets your needs. There are a few special programs available to our customers, including the Audi College Graduate Plan and the Audi Lease Loyalty Offer. Contact Audi of Jacksonville today to schedule your financial appointment, and get the keys to your new Audi vehicle today. Audi Jacksonville in Florida, serving Orange Park and St. Augustine, is proud to offer a fully-functional Audi service and repair center with everything you need to maintain your vehicle for years to come. Our highly-qualified technicians provide exceptional service in a timely manner to keep your day moving right on schedule. We handle oil changes, transmission issues, and vehicle repairs with care. Schedule your next service appointment or order the genuine Audi parts you need on our website or by calling Audi Jacksonville directly. We love serving your automotive needs at Audi Jacksonville in Florida, serving Orange Park and St. Augustine. Stop by today to see our new inventory or for your scheduled maintenance appointment. Our dealership offers long hours every day of the week to best serve you. We're conveniently located at 11401 Atlantic Blvd., Jacksonville, FL.